The Dearness allowance (DA) has been increased by the Government of India. Great news for all Central Government employee who work for Government of India. This is the latest news related to the DA increment by the Union cabinet of India. For such type of news on regular basis keep checking this website. we will share latest news and updates related to the Government of India. The Union Cabinet on Wednesday accepted an increase of two per cent in the dearness allowance (DA) on the request of central Government employee. 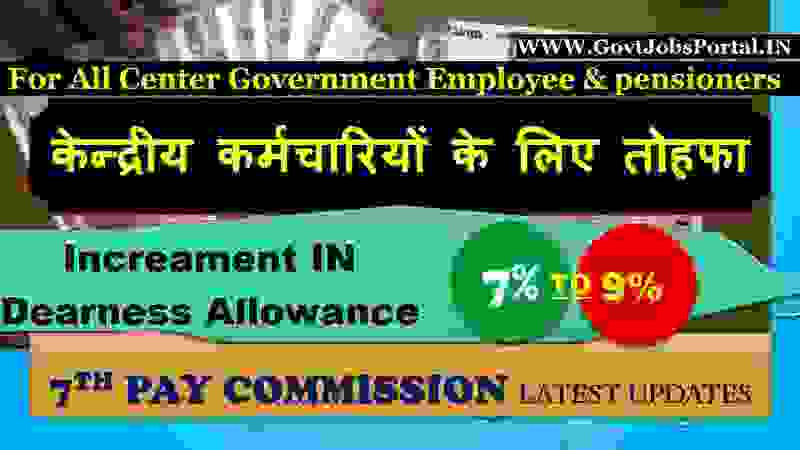 Earlier in the of month July Union cabinet decide to give DA allowance to the central Government employee with 7th Pay commission, but today they come with a new update related to the increment in the DA allowance by 2%. Union Cabinet earlier decide to provide the dearness allowance of 7 per cent which is now going to be 9% after this DA update. Currently there are more than 48 lakh Government of India employees. There are also more than 60 lakh pensioners. All these employees and pensioners will be benefited from this growth in DA. Now you must know that what is DA (Dearness allowance) is actually. DA/ Dearness allowances is a price of living adjustment payment payed by the Government to the employees as well as to the pensioners.